Review posted October 2, 2018. Sarah Crichton Books (Farrar, Straus and Giroux), 2016. 389 pages. I got to hear Terry Tempest Williams speak about this book at an ALA conference before it was published and got a chapbook of the first chapter, so I was watching eagerly for it to come out. However, it still took me a long time to get it read. I tend to read nonfiction slowly, a chapter at a time, and this one continued to be on hold at the library, so I couldn’t just renew it and keep going. I finally buckled down to finish and was even more impressed than I expected to be. I expected a lot of meditations on the beauty of our National Parks, but what I found is a lot more than that. There is much information about their history, and yes, about the wildlife and landscape, but there’s also a great deal about current concerns, such as oil companies taking over the land all around a national park and creating environmental devastation inside the park. Or the devastation wrought by an oil spill on a national park on the coast. Since this was written before the outcome of the 2016 presidential election, it was hard to read about the challenges and be pretty certain that things aren’t getting better. Here are some things Terry Tempest Williams has to say in the introductory chapter. In my wanderings among these dozen national parks, my intention was to create portraits of unexpected beauty and complexity. I thought it would be a straightforward and exuberant project, focusing on the protection of public lands, as I have done through most of my life. But, in truth, it has been among the most rigorous assignments I have ever given myself because I was writing out of my limitations. I am not a historian or a scientist or an employee of a federal land agency privy to public land policy and law. My authority is simply that of a storyteller who lives in the American West in love with this country called home. I have been inspired by the photographs and people included in this book. I have learned that there is no such thing as one portrait or one story, only the knowledge of our own experience shared. I no longer see America’s parks as “our best idea,” but our evolving idea; I see our national parks as our ongoing struggle as a diverse people to create circles of reverence in a time of collective cynicism where we are wary of being moved by anything but our own clever perspective. “The purpose of life is to see,” the writer Jack Turner said to me on a late summer walk at the base of the Tetons. I understand this to be a matter of paying attention. The nature of our national parks is bound to the nature of our own humility, our capacity to stay open and curious in a world that instead beckons closure through fear. For me, humility begins as a deep recognition of all I do not know. This understanding doesn’t stop me, it inspires me to ask questions, to look more closely, feel more fully the character of the place where I am. 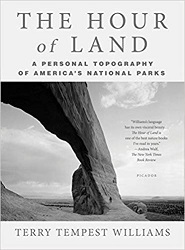 And so with this particular book, I have sought to listen to both the inner and the outer landscapes that spoke to me, to not hide behind metaphor or lyricism as I have in the past, but to simply share the stories that emerged in each park encountered. At a time when it feels like we are a nation divided, I am interested in how a sense of place can evolve toward an ethic of place, especially within our national parks…. This is the Hour of Land, when our mistakes and shortcomings must be placed in the perspective of time. The Hour of Land is where we remember what we have forgotten: We are not the only species who lives and dreams on the planet. There is something enduring that circulates in the heart of nature that deserves our respect and attention. The national parks she explores in this book are Grand Teton National Park in Wyoming, Theodore Roosevelt National Park in North Dakota, Acadia National Park in Maine, Gettysburg National Military Park in Pennsylvania, Effigy Mounds National Monument in Iowa, Big Bend National Park in Texas, Gates of the Arctic National Park in Alaska, Gulf Islands National Seashore in Florida and Mississippi, Canyonlands National Park in Utah, Alcatraz Island and Golden Gate National Recreation Area in California, Glacier National Park in Montana, and César E. Chavez National Monument in California. What she discovered in these parks is fascinating and surprising and thought-provoking. This book is a treasure and a challenge.